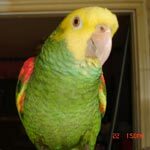 For anyone wondering how to touch your parrot's beak or what is the best way to develop personal confidence handling a biting parrot, this article should be particularly helpful. 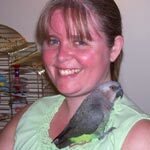 This is a taming technique I have rarely seen discussed but has helped me personally with all parrots I've ever interacted with. This taming method is for everyone beginner through expert and can be used on any parrot from tame to aggressive as long as you can safely approach the parrot. This should apply to all parrot species except for the smallest ones. This incredible parrot taming technique is beak touching. The first step of hand taming a parrot is to be able to touch it without getting bitten. 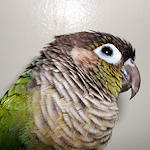 The only place on the parrot's entire body that you can safely touch and not get bit is the maxilla. This is the upper beak on a parrot. The reason you cannot get bit when touching the maxilla is because you are too far from the mandible (bottom beak) but too close for the parrot to be able to move and get your finger in its beak. By touching the upper maxilla, you are safely out of range of getting bit. Touching the parrot's head, tail, wings, feet, or head are far more likely to result in a bite if it isn't accustomed to being touched. And don't think you can touch its back. Parrots can turn their head over 180 degrees and will bite behind them in a flash. When familiarizing myself with a parrot that I'm uncertain of, I like to start by touching its beak and seeing how it reacts. First as I approach my hand slowly towards its beak (from the front and above), I am gauging the body language and trying to see if it is aggressive or calm. I check to see if the parrot opens its beak and leans in for my hand or stays still. I continue holding my hand above and just far enough that there is no way the parrot can reach to bite. Then I move steady and deliberately right to the upper maxilla and put my hand or finger on it. I like to get my thumb and index finger around the beak and kind of hold on. I may add a scratch from my finger nail. The parrot cannot bite me in this position and I can safely retract my hand upward at any moment and out of range if I need to. Besides the fact that this is the safest place to touch, the parrot is actually likely to enjoy it. It's one of the places they can't reach to scratch when they want to. The parrot will really like you for scratching off bits of food stuck or beak that is flaking off. So the act itself becomes positively reinforcing. The parrot will learn to remain calm and let you handle its beak. This serves as a behavior alternative to biting. Any attempt at biting will be negatively punished by the termination of beak scratches. As the parrot becomes more accustomed to this sort of hand to beak relationship, it will be less likely to bite the hands because it is used to hands touching the beak rather than the other way around. I'm not suggesting that this will eliminate biting all together. Other taming methods are certainly required, but this is a great supplement to them. As you touch the parrot's beak more and more, you will develop more confidence around it yourself. Both you and your parrot will have less fear of each other. While you worry about the parrot using the beak for biting, the parrot also fears you using hands for grabbing or hurting. But as you practice the beak touching/scratching, you will both learn that beak/hands are not meant for harm. As you gain more confidence you can scratch the lower mandible as well and move on to the cheeks and head. Besides the mutual trust this technique develops, it also serves a practical application. This allows you to file your parrot's beak if needed and to scratch off any dirt. So instead of fearing your parrot's beak, turn that around to a game that results in positively reinforcing beak scratches for your parrot. That is so funny you should mention this in an article! This is exactly the way I got Kika used to me and me petting him. He got scared when I tried to touch his neck or head for a scratch but he did let me touch his beak. For some reason he always calmed down when getting his beak scratched and let me move on to scratching other areas. And it is exactly how I always let non-birdpeople aproach him. I know he is comfortable with it. I thought it was just one of Kika's quirks, or mine. I thought it was funny that he posted this too. This is what I'm trying to do with Hardy(rescued wild caught LCA) to get him used to hands. When I give him a seed I try to sneak a beak touch in there. He is FAST as lightening though and knows that I'm trying to touch him. I've landed a few swipes here and there and have also moved from using a stick as the target to my finger. I felt like we made awesome progress when they other day he took a moment to lick 3 of my fingers before taking the seed! I have done this for as long as I can remember with Lucy and Jessie. Even to this date when I'm handling them and they're being nippy, I lightly grab their beak and gently move it back and forth and say no. I've never really seen it discussed and not sure how I really figured out how to do it, but the technique works very well for me. Hey this article is perfectly timed for me as I work on getting to know my BCC. He is so far very gentle with me, but his beak is HUGE and very pointy. This is such an awsome confidence and trust building excercise. Thank you for posting it! Yeah, this is a technique that I've used since I can remember. But yet I've never seen it discussed anywhere. I think it's pretty obvious and possibly a reason why I've never written about it before. But I figured I'd put it out there for newbies still learning just to touch the parrot initially. 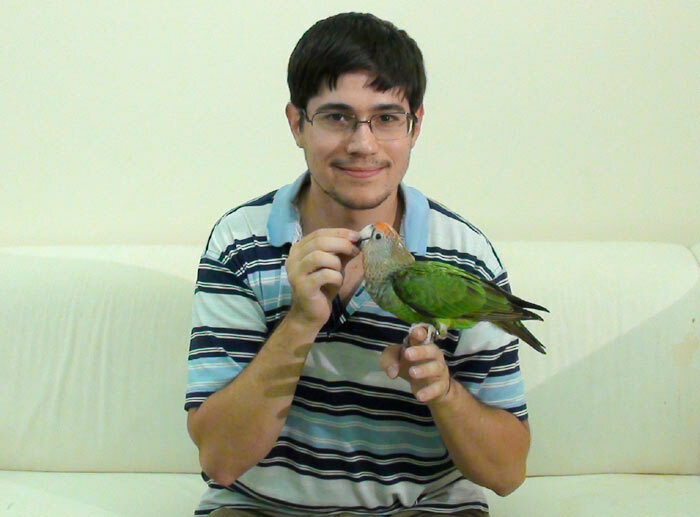 I think this method is so effective because it builds confidence not only for the parrot but also the handler. GooseBlossom likes being scratched on his head, under his beak, over his ears and between his beak and eyes, so this afternoon I decided to try his beak. He loved it! Thanks for a new idea for bonding with my bird. I have a 14 y/o gcc that when I first got him he would sit ok on my finger and you could pet his head with your nose. Not a big fan of hands but wouldn't bite. I've had roommates in the past and they've messed with him. The only way I can hold him is with a cloth. If not at some point he will bite. I'm sitting still, nothing is going on to startle/scare him... just for no reason you get bit. When he does that I say no with a glare and he goes back in the cage which he usually prefers not to be in. He likes hanging near me, always looks at me from afar, likes exploring his blanket's crevesses near me. I don't know what to do. He has a buddy gcc in his cage with him. They used to live apart but now are together in one cage since I moved to a smaller apt. She is a snuggler when she feels like it. I try to show mr biter this and you can tell he'd like to be in my hands too but I can't take these hard bites so toughing it out without response for a period of time to maybe get him to quit doesn't work for me. I feel bad for him. He doesn't realize he's creating his own world of a little wall with me. Any suggestions? I put him in the cage after a bite and have done it forever now. Doesn't matter. This behavior is so ingraned in him. It's not just hands either. When I put the cloth out for him to come out on bite! I would like to have him on my finger like the old days or under my hair by my neck but I don't see it. Help? 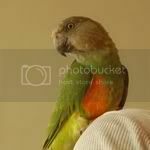 very nice my parrot bites sometime ill try that i never got bitten but i guss i have to get bit sooner or later so now it the time. I tried "copping a feel" of Diamond's beak and she just gave me a weird look and went about her business of bowing her head for more scratches. It was awkward. Is this more for larger beaked birds? 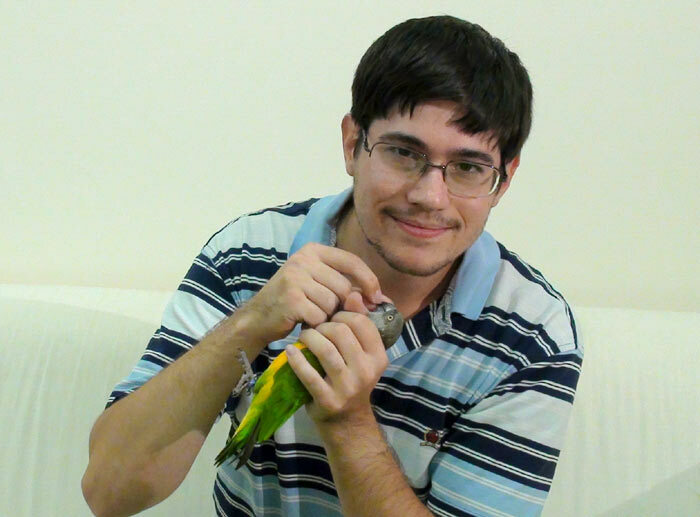 I know I am posting this several years since the last post, but I found this article interesting since touching my parrots beak is exactually how I got my bird comfortable with letting me touch her. One of the posts interested me about the bird that would reach down and bite the arm or the finger. In these situations it is never good to punish the parrot by returning it to its cage or retract your hand or yell at the parrot. This sort of behavior will reaffirm the parrot in a biting behavior. If you show fear in getting bitten the parrot will recognize this and take advantage of the fact. The best things to do in these circumstances from my expirence are one of the following. If the bird reaches down to give you a nip or a bite while it is sitting on your hand or arm then move the hand or arm that the parrot is sitting on up and down. This will distract the parrot and cause it to focus on regaining its balance or flap it's wings. When ever the parrot has stopped the desired behavior then reassure the parrot with positive reinforcement or praise by saying "good bird". The other technique is to bring your opposite hand up near the birds head and twiddle your fingers. This is also a good way to distract your bird and stop it from biting. Always be calm and use a calm and soothing voice and reaffirm good behavior with praise. Anyways... I hope this helps anyone who is having this problem and hope it helps Parrots connect with their owners to get as much play time out of their cages as possible. I can't wait to try this. Iam fostering a triton cockatoo who is deathly afraid of me. I have had him now for 25 days, their has been some progress he doesnt try and get away from me like he did but he has yet stepped up on me. I know this takes time. He was with his previous owner for 12 years and his owner now has parkinson and couldnt take care of him. I just wonder sometimes what the bird thinks, like why did my owner get rid of me. I look at ti ti and feel bad for him knowing that he doesnt understand. I will let you know how the beak touching works. The beak technique shown here only works for totally tame/not scared birds only. It is just a way to get them to come around to someone new. It's just a way I play with birds I know are friendly and could easily warm up to me and this is just a way to do it. For a bird that outright bites and isn't tame yet, this definitely is not the way to go. Then you want to look into positive reinforcement training. For example clicker/target stick method for teaching the bird to come to you, step up, etc. Myrtle was one when I got her and was terrified of everything. After about a year I was Mom but it wasn't until I had her 4 years that she put her head down for me to scratch it. She only allows head scratches when she is hormonal but I can do anything else. She spends a lot of time being a clothing accessory.